HMH Books for Young Readers, 9780547905730, 32pp. Gus is a very large, very special green dinosaur—and he makes the perfect city schoolbus. Or does he? He causes traffic jams, gets tangled in telephone lines, knocks down traffic lights, and creates potholes with his big stomping feet. If the principal fires Gus from schoolbus duty, how will the thirty-ton dino find a new job? Lynn’s wonderful, sketchy watercolor and pencil illustrations recall old classics, as does the pleasantly preposterous story of a dinosaur who just wants to be helpful. Julia Liu is the author of many children's picture books. Her work has been published in countries around the world, including China, Korea, Brazil, and the United States. 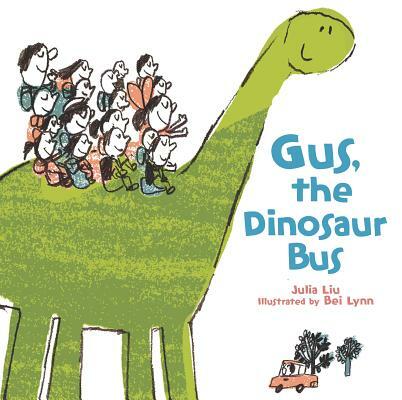 Gus, the Dinosaur Bus is her first book with Houghton Mifflin Harcourt. Bei Lynn is an award-winning artist who has illustrated around 20 picture books for children, some of which she has also written. Her illustrations are mainly made of watercolor and pencil and have been published in numerous magazines. Her first book, To Be Fish, was published in 1999, and the China Times has selected her books for its Best Children’s Book of the Year list several times. "In tone and visual details, this gentle story is reminiscent of Syd Hoff's classic Danny and the Dinosaur. . . . Gus's story holds universal appeal; even a dinosaur can learn to turn lemons into lemonade." "The story's mild suspense is just right for the book's audience. . . And the kindly pea-green dino steals the show with his huge smile and even bigger heart." "An especially charming addition to the genre." "Liu's evocative present-tense text in this Taiwanese import is rich with scene-setting detail yet also simple and confiding in its descriptions, hitting all those details that make this a perfect child-sized dinosaur fantasy."